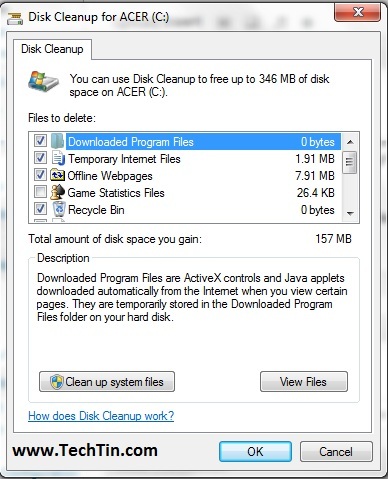 Windows Operating system comes with a very handy inbuilt tool “Disk Cleanup” that helps you to free up space on your hard disk to improve the performance of your computer. The tool identifies files that you can safely delete, and then enables you to choose whether you want to delete some or all of the identified files. 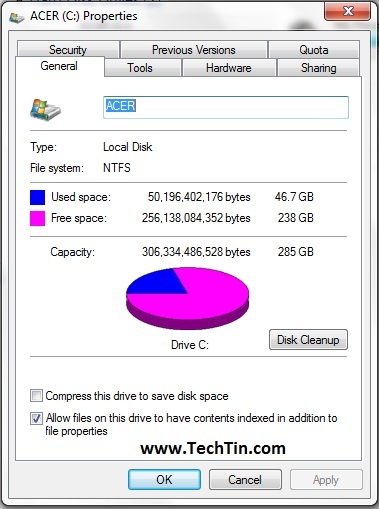 Using Disk Clean tool in windows 7 is easy to use and just need 2-5 minutes to complete cleanup task. Remove Windows temporary files such as error reports. Remove optional Windows components that you don’t use. Open Computer (Start >> Computer). Right Click the drive (like C:\ Drive) on which you want to perform disk clean up and select “Properties“. Windows will take few seconds to find files safe for delete and will show you files which are safe to be deleted. Check boxes for files that you don’t want to delete, and then click OK.
Windows will ask your conformation. Click “Delete Files” button. Windows will take few minutes to delete the selected files. Perform the same process for each drive.